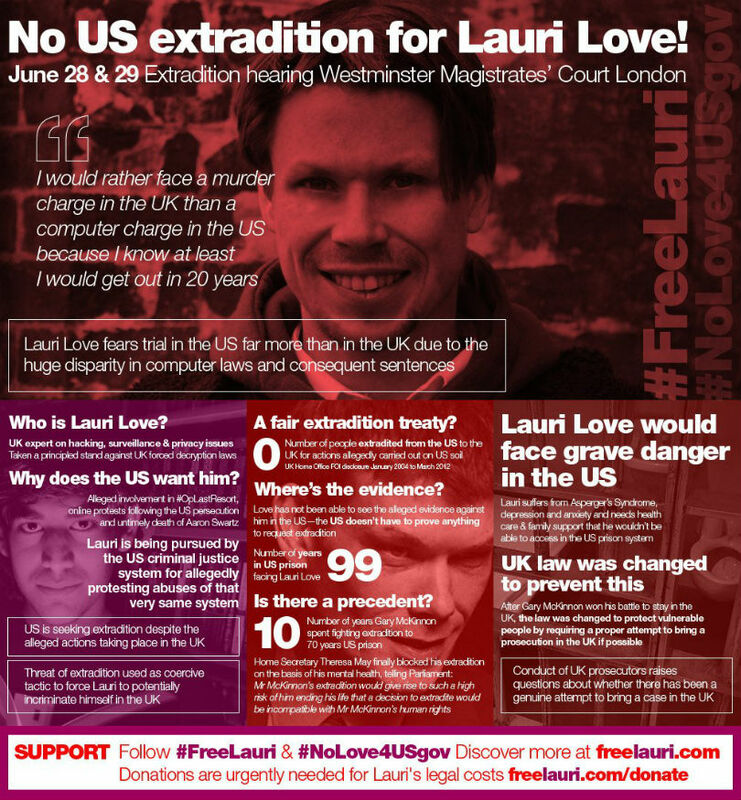 On Monday, Amber Rudd, the United Kingdom’s Home Secretary, signed the order to approve Lauri Love’s extradition to the United States. From that day, Monday, he and his legal team have fourteen days to file an appeal. The team reports that it intends to do so. Love is accused of stealing data from U.S. government agencies in 2012 and 2013 as a part of a hacking protest known as #OpLastResort. Because he is in Great Britain and the data breach took place in the United States, the fact that indictments have been filed against him in three district courts is known but how the U.S. plans to proceed is not known. His lawyers estimate that Love faces—if he is extradited, charged with the crimes that they think he is to be charged with, tried, and convicted—up to 99 years in prison. Love and his lawyers have yet to see any evidence against him. If the request to appeal is granted, the appeal will be heard in the spring of 2017. The Courage Foundation, which is helping fund Love’s defense, reports that this appeal may not be the final legal step, as there are motions that can yet be filed on Love’s behalf with the U.K. Supreme Court and the European Court of Human Rights. More than 100 members of Parliament, across party lines, signed a letter in October on behalf of Love that is to be sent to President Obama, the U.S. ambassador in London, and the British ambassador in Washington. It asks President Obama to withdraw the extradition requests. (The link in the previous sentence is to a PDF of the letter.) MPs continue to add their names to the letter. David Burrowes, a Conservative MP for Enfield, spoke about Lauri Love with Prime Minister Theresa May during Prime Minister’s Questions last month. She did not reply with specifics. Barry Sheerman, a Labour MP from Huddersfield, spoke of Love’s case on the floor of the House of Commons during a debate two weeks ago with the nation’s Solicitor General, Robert Buckland. In both official conversations, the questions were specific and pressing because the case is pressing, and the answers were not.